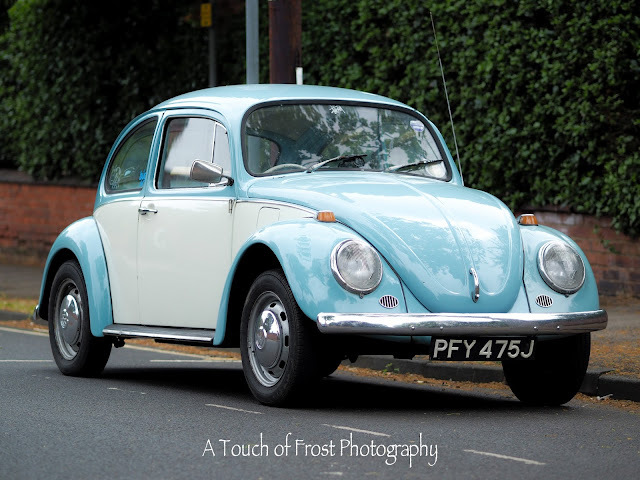 Coming home from shopping in Beeston, I saw this vintage Volkswagen Beetle parked up on a road that I use to get home. It's quite a nice cornflower blue colour, and dates from 1970. The bodywork seemed to be in good condition. So it has either been well looked after, or has had some restoration work done on it. Either way, it was nice to see it being driven around. My dad had one when I was younger. A black one it was, and to give it a bit of identity, he got some thin strips of gold tape and put it around the doors. I'm not sure how long it lasted, but I do remember it beginning to peel after a while. He then sold it and got a white Renault 5. I hope to see a lot more old cars tomorrow, as it's the annual vintage car show at Wollaton Park. Just hope the weather keeps dry and sunny.